Apollo's final lunar mission took advantage of behind-the-scenes lobbying by the lunar science community to have a professional geologist visit the Moon. Many of the astronauts, whose backgrounds were usually in the fighter-pilot/test-pilot milieu, believed that a dangerous environment such as an experimental spacecraft in the vicinity of the Moon was just not the place to take someone who was not already inculcated in the philosophies surrounding aviation. Indeed, it was a requirement for the five scientist/astronauts taken on by NASA in 1965 that they learn to fly jets. 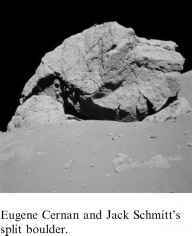 Only one of them, Harrison 'Jack' Schmitt, was a geologist, and he proved a worthy representative when he flew with Eugene Cernan and Ron Evans on the 12%-day Apollo 17 mission to explore a region of unusually dark soils in a valley near the shores of Mare Serenitatis. The interest in this site was stirred by Al Worden's observations during Apollo 15 of dark halo craters on the floor of the valley which looked like a possible source of modern lunar volcanism. Apollo 17's launch on 7 December 1972 was notable by being the only night launch in the programme, the Saturn V's fire rising like an artificial sun to light up the eastern coast of Florida. To reach the location of their landing site, the spacecraft had to adopt a Moon-bound trajectory that took longer than any other to get there. The subsequent orbital dance around the Moon was the most involved of all the missions. 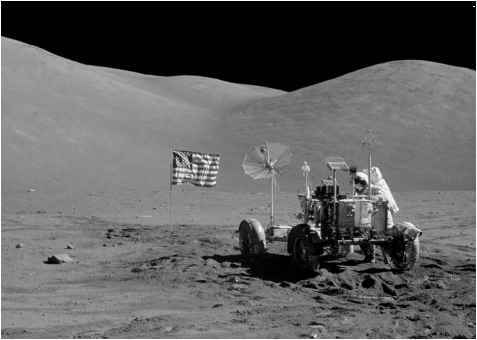 Having landed, Cernan and Schmitt immediately began preparations to exit the LM Challenger, deploy their rover and set up their ALSEP science station. 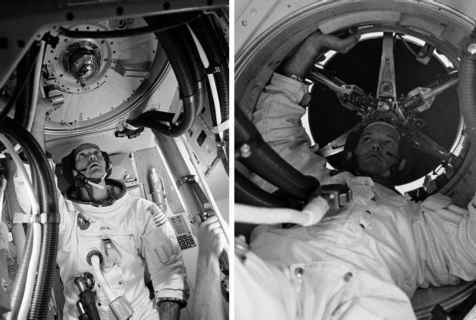 Similar to Scott's experience on Apollo 15, Cernan had difficulty extracting the deep core drill out of the ground, despite having a special jack to aid him in the task. The extra time taken to extract it meant that a planned short drive to a nearby crater was consequently curtailed. 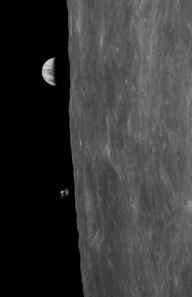 Apollo 16's CSM Casper and Earthrise taken from the LM during station-keeping. over seven kilometres west to the base of a mountain. Here they sampled boulders that had rolled down from outcrops further up the slopes, allowing them to collect samples from sites that were well beyond the rover's reach. On the way back, they stopped at a crater that was later dubbed 'Ballet' because as he took samples in it, Schmitt nearly lost his footing and performed wild gyrations in an attempt to regain his balance. A frisson passed through those conducting the mission, both on Earth and Moon, when deposits of orange soil were found on the rim of one of Worden's dark halo craters. Nothing like it had ever been seen on previous missions, and its colour suggested iron oxidation or rusting, something that normally requires water - a substance notable by its apparent absence on the Moon. Subsequent analysis of the material showed that it was certainly due to volcanism, but of an ancient variety when spectacular fire fountains had sprayed molten rock hundreds of kilometres into the sky some 3 billion years ago. It had simply been excavated by the impact that made the crater. A productive range of stops on the final moonwalk of the Apollo era included a visit by Cernan and Schmitt to another mountain where a split boulder had come to rest. Schmitt's expert eye spotted the signs of alteration that showed how more than one massive impact had worked and reworked the surface of the Moon, and by implication, Earth during their infancy. 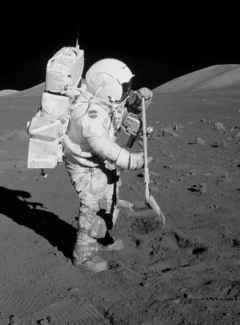 Jack Schmitt using a rake to sample lunar stones on Apollo 17. Eugene Cernan at the rover during Apollo's final moonwalk. 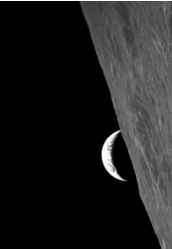 The view of Earth as Apollo 17 came around the Moon. the coast back to Earth by exiting the hatch and manoeuvring along the SM to fetch them. The visit of Apollo 17 to a site nearly as grand as Hadley was the peak of a spectacular mission that brought the initial human exploration of the Moon to a highly successful close.